The headline in the Philippine Daily Inquirer read: ‘Yaya Dub’ misguided in support for ‘lumad,’ says military exec. The article then goes on to quote Brigadier General Joey Kakilala, who is the commander of the Civil Relations Office of the Armed Forces of the Philippines, as saying of Mendoza and others: “‘Yung social media support naman. Hindi alam nina Aiza Seguerra, Maine Mendoza, hindi nila alam ‘yung real story. Kung malaman siguro they would have reservations,” said Kakilala, who is a commander of the Civil Relations Office of the Armed Forces of the Philippines. So what is the “real story”? General Kakilala did not offer any explanation — nor did the Inquirer author press him for any specifics. As most anyone knows who’s been following the story of the Lumads, the AFP’s so-called “real story” is basically a time warped rendering of early 1980’s martial law mentality projected forward into 2015, where those who oppose the AFP and strive for social justice are labeled communist sympathizers if not actual communists. But that was 35 years ago. Today, really, that’s the line? Meanwhile — this is more than a struggle for control of ancestral lands. Last Sept. 1, Emerito Samarca, the director of Alternative Learning Center for Agricultural and Livelihood Development (Alcadev), and Lumad leaders Dionel Campos and Bello Sinzo were killed by suspected paramilitary groups in Sitio Han-ayan in Lianga, Surigao Del Sur. Samarca was found dead in a classroom, hogtied, stabbed and with his throat slit . Social media sentiment exploded when photos of the killing in a lumad school circulated online. Meanwhile Maine Mendoza, who is a smart young woman, and others including, as the general notes, Aiza Seguerra but also none other than Wally Bayola, Maine’s stablemate on Eat Bulaga, are standing with the Lumads, and no, they are not “misguided” or “misled”. They get it. 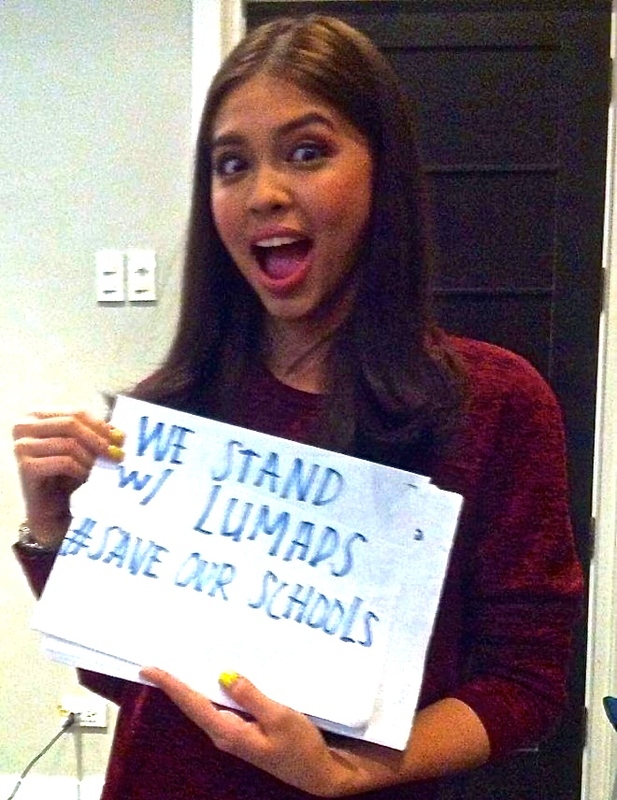 A protest on twitter using the hashtag #LumadDinAko has sprung up; Maine Mendoza’s brother in law is leading support from AlDub Nation; and updates flow at @aldubforlumad on twitter. Most compelling of all is a letter written by Lisa Dino-Seguerra and published on Facebook. How funny for you to easily accuse my husband of being misled in our stand against the oppression of our LUMAD brothers and sisters without supporting it with any reason. You say “…hindi nila alam ‘yung real story. Kung malaman siguro they would have reservations”. You were given the floor in the article to tell us the real story and yet you did not disclose your side. Oh yes they are…and we are moved. Try going to Liwasang Bonifacio and you will see the ALCADEV students who are raring to go back to their schools and study again; the tribal leaders who feel so powerless because they can no longer look after their own people;the fathers who cannot go back to their farms and feed their families;the mothers who had to leave their children in the evacuation centres, travel to Manila with heavy hearts in the hope that they can go back there with ANSWERS. In fact, they, too, were trying to appeal to YOUR emotions sir. For the longest time, the Lumads have remained in their communities hoping that if you see how peacefully they live, your military troops will leave them alone. They opened their homes to you,fed you, because they believed all of you when you said the military will protect them. They did not need your presence, they were ok on their own, but your men insisted, so they relented. But what did your MEN do? Your military men used the schools as camping grounds, disrupted classes, harassed the teachers, interrogated the students and forced them to admit that their parents are Rebels. I talked to these students and they are all afraid of you.You even accused ALCADEV as being used as a front to indoctrinate lumad children with the communist ideology of the NPA. Wow. Wasn’t it just a year ago that the school received a National Literacy Award from DepEd? Now, more than 80 schools are under attack and depriving these children with the opportunity to learn. Oh, and sir, just yesterday, a teachers’ cottage of ALCADEV was torched down along with books, school supplies, a sewing machine, rice stocks, the school generator, audio-visual equipment and other materials. Yeah, talk about being misled. Oh sir, don’t even get me started on the killings. Last night, I met Ate Yosie, wife of tatay Emok, the executive director of ALCADEV who was hogtied, stabbed and his throat slit in the room of the school by your Magahat-Bagani paramilitary group. The military has been openly accusing the school of poisoning the minds of the lumads and double as “training” centers for rebel recruits. Regardless if this is true or not, does this give you all the right to KILL him? I cannot imagine the pain she is going through right now as well as the students of ALCADEV who are grieving because of the loss of their mentor. And what about Michelle Campos? Daughter of Dionel Campos, a Manobo leader who was shot in the head in broad daylight in front of the whole community by your people.I talked to Michelle personally as well the residents of the community and they told me the story of how your men kicked the doors of their houses and forced all of them to gather together by the basketball court to witness the execution of Dionel Campos and Datu Bello Sinzo. Your men told all the residents to stop supporting the NPA or else they will all suffer the same fate. You, the supposedly protectors of our FREEDOM!!! I must admit though sir Brigadier General, it was quite genius of you to choose a paramilitary group composed of lumads who no longer live in their communities to kill their own kin. In that way, you can wash your hands and claim it as “tribal war”. For a moment, we were a bit “misled”. Tsk tsk tsk. Almost but not quite. In short, contrary to what you want to spread in the media na pati kami ngayon ay MANGMANG—- “misled”, “misguided” ,ginagamit at nabubuyo….I tell you this. WE STAND WITH THE LUMADS. WE stand with the 700 of them right now who travelled for days to get to Manila to air out their sentiments as well the more than 3,000 others who were forced to evacuate their homes because of military operations. These people have first hand experience of all the atrocities done by your military men and their paramilitary counterparts. Marami sa mga Ata Monobong nakausap namin ay lider ng kani-kanilang organisasyon. Hindi man nakakapagtagalog ang iba, pero hindi na sila mangmang sa mga nangyayaring kaguluhan. Alam nila ang kaibahan ng rebelde sa militar.They have been empowered by the people na naniniwala sa pinaglalaban nila at sa mga paaralang nagsisilbing liwanag para magkaroon sila ng kaalaman. Now they are being robbed off of that opportunity. So please, dont tell us that we are misled and misguided. HINDI KAMI MANGMANG. We believe in their cause. We empathize with their plight…kaisa kami sa pakikipaglaban nila sa kanilang karapatan at naniniwala kami sa kanila. Ang gusto nila ay katahimikan at kapayapaan at bumalik sa kanilang lupang tinubuan. So ask you now sir….WHAT IS THE REAL STORY?What is your story? For a serious look at the Lumad situation, I recommend Inday Espina-Varona’s excellent in-depth blog post. I intend to look more deeply into this, and will have more to say about it in coming days and weeks. I believe that engagement in matters such as this by #AlDub Nation and the #AlDub team represent a very positive manifestation of what I would call the “Spirit of AlDub” — and I hope that efforts to shine a light on this issue will continue.